Modern real-time applications like avionics and Internet-of-Things are required to aggregate more features and functionality with less production costs. Future applications like CityAirbus and autonomous driving require large distributed systems to deliver expected services and performance. For such systems, scheduling large set of applications may lead to contradicting problems, e.g., resource scarcity and swap (size, weight and power). The time-triggered (TT) computation model has the potential to ease the way for solving all these issues. However, TT scheduling poses several challenges including complex network architectures, co-synthesis of allocation/scheduling and complex constraints (e.g., precedence, latency, reliability, etc.). Although state-of-the-art processor and network scheduling approaches can be used to generate TT schedules for small to medium sized systems, they fail to provide solutions for large distributed systems. 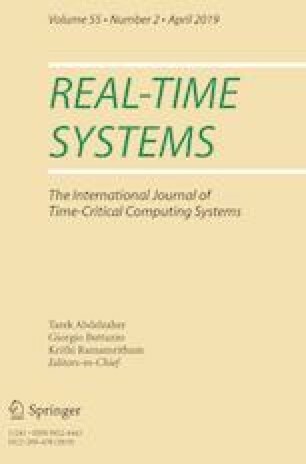 In this paper, we discuss the design of a modular, scalable and flexible scheduler for large distributed TT networked systems. We introduce a novel search-space pruning technique, based on the response-times to generate schedules for large systems within reasonable time. Based on our modular scheduler design, we also provide an extension for TTEthernet networks. Through extensive evaluation, we demonstrate that our scheduler is capable of fulfilling the demands of modern and future real-time applications and that it dominates the state-of-the-art TT scheduling approaches in terms of schedulability and run-times. We would like to thank Ramon Serna Oliver and Silviu S. Craciunas (from TTTech Computertechnik AG, Vienna, Austria) for their generous support by providing their task-set generator for creating synthetic system loads for TTEthernet networks. Furthermore, we would like to thank manuscript reviewers for providing valuable comments. These comments allowed us to improve manuscript quality.